Mayor Bill de Blasio this month signed legislation that will expedite approval of demolition and construction work performed by New York City–procured contractors under the Build it Back program. This bill will help to fast-track the city’s rebuilding efforts that continue four years after Hurricane Sandy. Build it Back is a city initiative that provides funds to rebuild areas devastated by the historic storm. “We are pushing every day to accelerate construction, cut red tape and get people back into their homes. 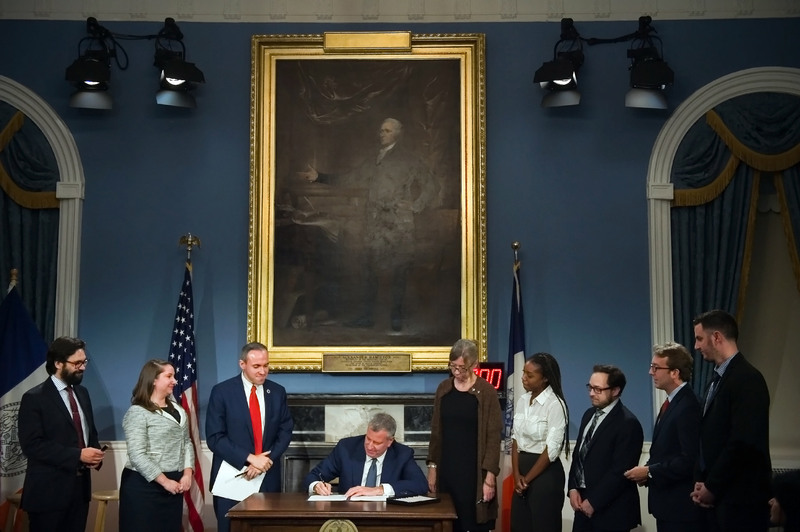 I want to thank Council Speaker Melissa Mark-Viverito for her leadership, the bill’s sponsor, Council Member Mark Treyger, and the rest of the City Council for passing this essential bill,” de Blasio said. The bill, known as Intro. 1341, offers two ways for the City to speed up construction: First, it expedites the demolition process by allowing necessary paperwork to be completed after the demolition, given that the work is supervised by licensed safety professionals. Second, it allows projects that were not allowed to move forward because of violations pre-dating the Build It Back program to proceed while simultaneously protecting the safety of those homes and their homeowners in Brooklyn, Queens, and Staten Island, many of whom are ready to get back to their daily lives. The goal is to get those people back in their homes, but also to plot a path forward for resilient neighborhoods that can withstand future storms. Previously, the de Blasio administration and the city council have provided tax relief for property owners affected by the 2012 storm and have also helped to remove unnecessary zoning restrictions on both elevation and construction. “Four long years after Hurricane Sandy, many New Yorkers are still waiting to be able to return home. We cannot allow red tape or sluggish bureaucracy to continue to delay the full recovery of the families enrolled in the Build it Back program. I am proud to have sponsored this long-overdue legislation, in partnership with the Mayor, and prouder still to see it signed into law. This bill is designed to remove unnecessary obstacles that have prevented the Build it Back program from moving forward while ensuring that rigorous safety standards are upheld,” said Councilmember Mark Treyger, chair of the Committee on Recovery and Resiliency.